This amazing truck was purchased by Martin Andersen as his first farm truck with his father on the "Andersen Lakeview Farm" south of Seven Persons Alberta. My fiancee and I (Martins daughter) went out to the farm, and pulled her out of the tiny space she had sat for over forty years, and winched her on to the trailer. At first I was devastated.... 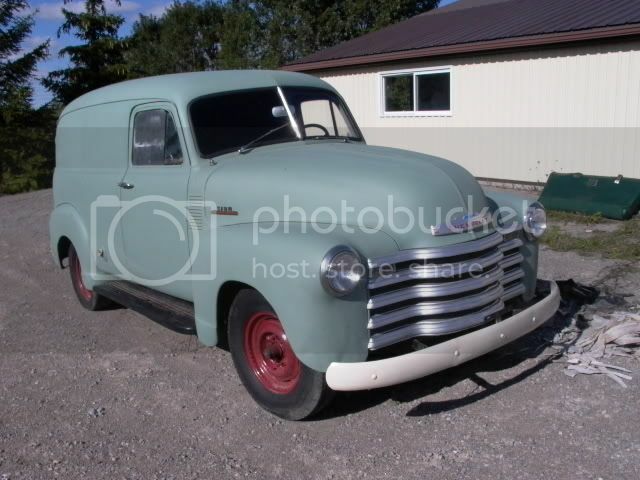 I was certain that the fenders, boards, hood, grill, etc was all there when I had first found out about the truck! But alas... bare bones. The disappointment had almost set in, when we decided to search all of the surrounding outbuildings. The last building (and least likely, so we thought) that we checked before going home defeated was where we hit the mother load!!!! She was, after all, a COMPLETE truck. And not only that, but unknown to us, Martin had done some chrome electroplating as well. We found a rotted out old box with the grill bling, handles, and many other items still wrapped in disintegrating paper from the chrome shop. Even a GOLD plated maple leaf grill medallion. We couldn't believe it. That was an incredible day, and we are looking forward (mostly me) to many more, as I disassemble, and renew every part of this beautiful truck. Hopefully the stovebolt gods will make our photos public so we can share our amazing project. Last edited by Ray in ALBERTA; Sat Jun 16 2018 04:53 PM. Brilliant! Only a stovebolter will appreciate a resurrection like this. I would of been another laughing fool as well. Cheers to you and your ensuing project. Absolutely stunning! What a great story and fine looking truck. Congratulations and good luck. You are one lucky guy. That dual axle truck will make one heck of a truck. Congrats on saving it rather than calling the junk man. It taint junk!!! Looking forward to following you on your journey. How sweet it is! Oh, Welcome to the Stovebolt! Yes you are! Mainly the fiancee but the truck is good too. Lucky also to find all the spare parts, saves a lot of aggravation and money. Welcome to the site and let us know how you make out. great story!! Sounds like a fun project!! Awesome recovery! Good luck and have fun with your restoration!